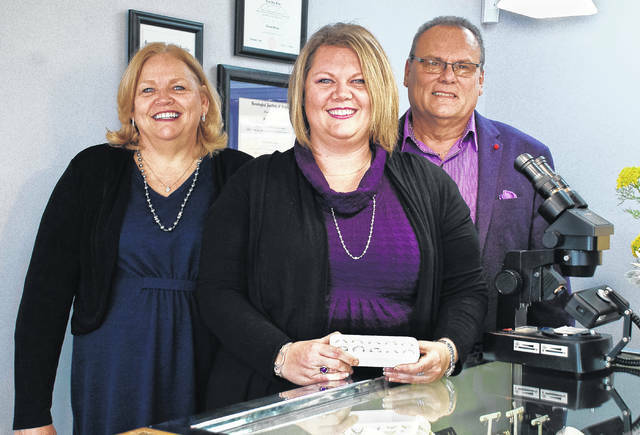 Standing behind one of their jewelry cases in their new location are, left to right, Sherry, Kristy and John Fetzer of Delaware Diamonds. Over the holidays, the family business moved from downtown Delaware to 652 W. Central Ave., Suite 80. Enjoying their new southern exposure, Pepper and Harold don’t seem to mind the sunlight their new window at 652 W. Central Ave. in Delaware provides. Who are Pepper and Harold? They are feline greeters at Delaware Diamonds. “We’re all about family,” said Kristy Fetzer, owner of the business. Fetzer said Pepper is a 5-year-old female black cat who is usually the greeter, and Harold is a 16-year-old male orange and white cat. She said both cats were rescues. Delaware Diamonds is a family business because Fetzer works with her parents Sherry and John Fetzer. Well, actually her parents work for her. Kristy Fetzer said the family’s combined number of years in the jewelry business is close to 50 years. She said she has 15-plus years of experience and her parents have been in the business for 30 years. Kristy Fetzer added she is a “graduate gemologist and a certified appraiser” through the American Gem Society. Her mother is also a “graduate gemologist” and an expert in pearls, and her father is a certified jeweler who does jewelry repairs and design. The Fetzers opened Delaware Diamonds on North Sandusky Street in the downtown in 2013. Over the holidays, they took two weeks off to move the store to the new location. Moving to the new location has been a plus on the business side for the Fetzers. Sherry Fetzer said when Carlisle Elementary students are picked up after school, the parents and grandparents park in the shopping center’s parking lot. She said it’s free advertising for the store. Sherry Fetzer added the family is far from pushy when it comes to sales. John Fetzer said the family isn’t trying to get rich. “We’re just trying to make a living,” he said. Kristy Fetzer said with the exception of Christmas, they do more jewelry repairs than purchases through the year. She said customers bring in heirlooms asking what can be done with the piece. In the jewelry cases and on the sales floor, the store’s line includes watches, necklaces, earrings and bracelets. “We have sterling, gold, real stones and synthetic stone, which allow for different price points for people,” Kristy Fetzer said. Kristy Fetzer added the store carries a local line of blown dichroic glass jewelry. However, the main attraction of the store is still Pepper and Harold. Kristy Fetzer said the cats are the draw for the store. She said since the store has moved, customers ask how the cats are doing and adjusting to the new store or bring them treats and toys. “The funny part is everybody knows our animals’ names, but they don’t know our names,” Sherry Fetzer said. To learn more about Delaware Diamonds, visit the business’ website at delawarediamonds.net. This entry was tagged Diamonds, Dleaware, Fetzer, John, Kristy, Sherry. Bookmark the permalink.